This is the final story in a series about how communities are responding to failing septic systems in the rural South contributing to the rise of poverty-related tropical diseases like hookworm. Read the first, second, and third. When she was a teenager in 1967, Katherine Egland was one of a dozen students to integrate the Hattiesburg, Mississippi, public school system. As a member of the NAACP youth program, she spent her childhood afternoons with civil rights titans Dr. Martin Luther King Jr. and Medgar Evers. By that point, Egland, a chairperson of the NAACP’s Environmental and Climate Justice program, was fighting another kind of backyard terror, what she calls “the biggest civil rights crisis” in the South: climate change. “Katrina was a wake-up call,” Egland said. After the storm, she ignored damage to her own home, a bungalow a few blocks from the ocean in Gulfport, Mississippi, to organize better relief efforts for low-income families in rural areas. Five years later, while her community was still recouping losses, two major disasters occurred. “While I had the BP oil spill out my front door, four miles out of my backdoor was a failing coal plant,” said Egland, who is soft-spoken and no-nonsense. Around the same time former Alabama Governor Robert Bentley was approving construction plans to renovate his office’s coastal mansion with leftover BP oil spill funds, Egland was organizing her community to pressure Southern Company to shut down the failing coal-fired power plant in Gulfport. She held town hall-style education and listening sessions and began advocating for safer practices from the energy companies that rule the economy along the South’s coastline. Rallying her neighbors on environmental issues, Egland said, began with overcoming the stereotype that environmentalism was a “white thing.” She started hosting “Climate Change 101” in church halls and community centers, educating folks about the connections among carbon emissions, stronger storms, rising sea levels, overburdened infrastructure, and the spread of disease, and how all of those problems perpetuate deep-rooted cycles of racism and poverty in the South. The connections Egland has been making with climate change are increasingly important as erratic weather patterns, warming temperatures and flooding have exacerbated the resurgence of tropical diseases like hookworm in Alabama’s Black Belt region, where soil conditions and failing wastewater infrastructure have left vulnerable communities to contend with a public health crisis. Longtime organizers say officials with the power to address these problems effectively have lacked the necessary political will because there’s no money or glory in solving problems for people who are poor. Last October, Senator Cory Booker introduced the Environmental Justice Act of 2017, a long-shot effort that failed to pass. Policies that do progress are slow-moving: in July, the Senate passed a Farm Bill, co-sponsored by Alabama Senator Doug Jones, which would grant up to $15,000 per household for families in rural communities where sewage is decentralized. But community leaders like Egland aren’t waiting for top-down climate policy solutions. Instead, they’re taking justice into their own hands in the way Southerners always have: through hard-fought community organizing in churches, schools, and homes, and through relentless pushback against the exploitative industries that this region is, by design, so reliant on. More than half of Americans think that climate change will affect the U.S. but will not affect them personally. Those numbers are in sharper contrast in the South, dubbed a “red-red” region for the deep-red Republican voters and the deep-red on maps which indicates the disproportionate impact climate change will have on the economy, land and lives in the region. Despite overwhelming scientific evidence, many Southerners still deny climate change and welcome industry to the region. Southern state governments often offer companies incentives, tax breaks, and lax environmental regulatory adherence to encourage industry. In return, towns get jobs. That’s created a difficult cycle to break: while the nation reaps the benefits of fossil fuel, chemical, or other industries’ production, communities in the South suffer many of the health consequences. As the state’s lone Democratic Congresswoman, Rep. Terri Sewell (AL) said, “This isn’t a standalone issue.” With Rep. Mike Rogers (R-AL), Sewell introduced the bipartisan Rural Septic Tank Access Act to address her constituents’ wastewater crisis, but she’s also emphasized the more complicated need to address underlying issues of poverty in the region. "I come from the Black Belt of Alabama, an area that is rich in culture and history, but one which faces an infrastructure and technology crisis that has handicapped families, workers, businesses and communities,” Sewell said. As Earth’s temperature and sea levels rise, more extreme and prolonged flooding exacerbates those existing infrastructure issues. Spend a few months talking to environmental organizers, scientists, public health officials, public policy professors, politicians and their henchmen to find out how the U.S. is addressing the resulting rise of tropical disease and other public health concerns in communities without access to sufficient healthcare, and you’ll meet a lot of folks overwhelmed by the problems attached to one issue like wastewater. The South is in “a unique situation,” said Dr. David Holcombe, regional administrator and medical director of public health for eight central Louisiana parishes. Ryan Juskus was in the midst of doctoral work in theology at Duke University when he heard about Catherine Flowers, the rural development director for the Equal Justice Initiative and the ways she’s organizing in Lowndes County. Juskus works with the Restoring Eden Project, a Christian organization that trains students from historically black colleges to canvass in North Birmingham, helping to fill a data gap to better understand exactly how many people suffer health issues because of a nearby coal-burning plant. “It’s the kind of research that’s done with, for and by communities so they can use the work in their own efforts of organizing and solving problems,” he said. This year, the coal company’s CEO was convicted on four federal charges for bribing an Alabama state representative to vote against the expansion of an Environmental Protection Agency Superfund site in the community. Through these efforts, communities are creating invaluable data, said Dr. Michelle Fanucchi, an associate professor in the school of public health at the University of Birmingham at Alabama. Alabama is one of two states that doesn’t keep an emergency room registry which Fanucchi said offers public health officials insight into the incidents of respiratory and cardiac illness by locality and proximity to pollutants. To better understand how climate change-related problems are connected, and could be solved, we need better recordkeeping, transparency, and communication, Fanucchi said. The Alabama Department of Public Health rules and regulations for septic tanks, for instance, is 135 pages long. That’s where residents are expected to look for an understanding on their failing wastewater systems. “Who has time to read that?” she said. Improving communication also means meeting people where they are. In Mississippi, Egland said that means listening to what matters to people in the community. “You’re going up against the power companies, and their message is a lot simpler than ours: Jobs. They prey on the vulnerability and the desperation, and so we’ve got to have a message to show we care for economic development,” she said. In Louisiana, Retired Lt. General Russel Honoré has a different set of tactics. Honoré is often credited as the guy who helped turn around Hurricane Katrina relief efforts, who walked through the streets of New Orleans commanding U.S. troops to put down their guns because they were on a rescue mission for their fellow citizens. He calls himself a pollution fighter, and like Egland, he’s organizing small communities of color along the coast. Unlike Egland, he avoids talking specifically about climate change to those communities. It’s a point of contention, a distraction, Honoré said. Instead, he focuses on the chemical plants along the Louisiana waterways, often built in placed like Mossville, a once thriving, predominantly black town, founded by freed slaves and wiped off the map by pollution. “[Since Hurricane Katrina], a lot has been done to replace and repair the communications grid capacity along the Gulf,” he said. “A lot has been done to prepare the first responders to more accurately assess what more has been done to prepare people for evacuation. Some things haven’t changed: our awareness to stay out of the flood zone is number one,” he said. Honoré pointed out areas of Baton Rouge where flood waters were waist-deep after heavy rain in 2016 are now slated for new residential construction. Like Egland, Honoré connects the consequences of fossil fuel production with their individual lives. In April 2015, Southern Company stopped burning coal at the failing plant in Gulfport, Mississippi. Egland called the transition to natural gas “a huge victory” for the NAACP and the Sierra Club. She said it’s proof outside organizations can be effective in rural communities when partnering with organizers on the ground. It was just one battle in her long career fighting for the communities of color exploited by companies for generations. Now, 50 years after her own involvement as a child in the NAACP youth program, Egland serves as a mentor. She’s impressed with the ways students today break down messaging from climate activists and the fossil fuel industry, by the ways they’re not overwhelmed by the severity of it all. Earlier this year, 10 kids in Florida sued Gov. Rick Scott to institute climate change policy, joining kids from Uganda, the Netherlands, and India who’ve taken similar action. 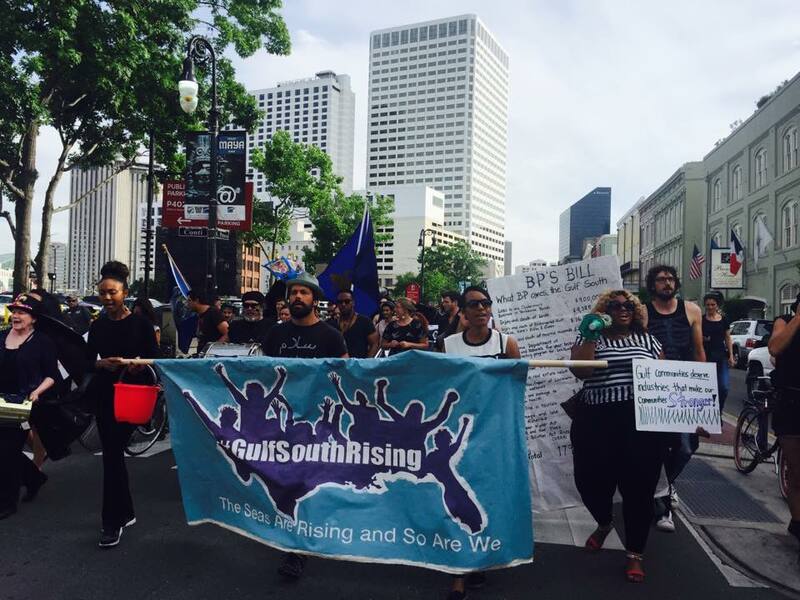 This story, and the series it’s a part of, came to Scalawag from Southerly, an independent media organization that covers the intersection of ecology, justice, and culture in the American South. This series is supported by the Solutions Journalism Network, a nonprofit organization dedicated to reporting about responses to social problems.